From January to October last year, oil imports from the state amounted to more than £900m, accounting for 5% of all the oil imported into the UK. Official data shows that the UK imported 2,911 tons of oil and oil products from the Gulf state in 2014. Again data from this source may exclude imports via third party countries not captured in the UK trade info stats. The data indicates that sales of arms to Saudi Arabia may have increased dramatically since the Conservative led coalition came to power in 2010, with major increases coinciding with the intensification of the war in Syria and the growing civil conflict in Yemen. Back in 2008, the UK arms sales to the country came to just over £36m. From 2010 to 2015, arms exports to Saudi Arabia came to more than £1.5bn; 95% of that trade was done from 2012-15. Using official data from UK Trade Info, Unearthed examined imports and exports between the UK and Saudi Arabia. Focusing on oil and arms and munitions, we used codes 27, 2709, 2710, 2711, 2712, 2713, 2714, and 2715 to build a picture of Saudi energy exports to the UK. We used code 93 to examine arms exports to the Kingdom. You can build your own table using the trade data here. UK connections with Saudi Arabia are extensive. In 2013, UK Export Finance (UKEF) announced that it would guarantee £450 million of finance for UK exports to a petrochemical facility in Saudi Arabia, known as the Sadara Project. UK involvement in the project, co-sponsored by Saudi Aramco and Dow Chemical Company, was heralded by UKEF’s acting chief executive, David Havelock, at the time as a “prestigious project”. The most recent UKEF annual report reaffirms the UK’s support for the project. Seperately the government has been talking up investing in the Gulf state for some time. A presentation by UK Trade and Investment (UKTI) from 2014 seen by Unearthed talks up plans for hundreds of billions of dollars worth of investment in the country’s energy infrastructure and tourism industry. The presentation by UKTI, delivered at a breakfast meeting in Great Yarmouth with oil industry figures in October 2014, gives an insight into the government attitude towards Saudi Arabia; praising the Kingdom’s economic strength and “political stability”. Both Labour and Liberal Democrats have called on the Conservative Party to withdraw its support from the Saudi government, after 47 people were executed in the country last week, including noted Shia cleric Sheikh Nimr al-Nimr. UK arms sales to the country have also come under scrutiny in recent months, amid accusations of war crimes committed by Saudi fighters involved in the civil war in Yemen. A legal opinion obtained by Amnesty International in December argued that UK arms sales to Saudi Arabia were fuelling the Yemeni civil war and were in breach of international law. 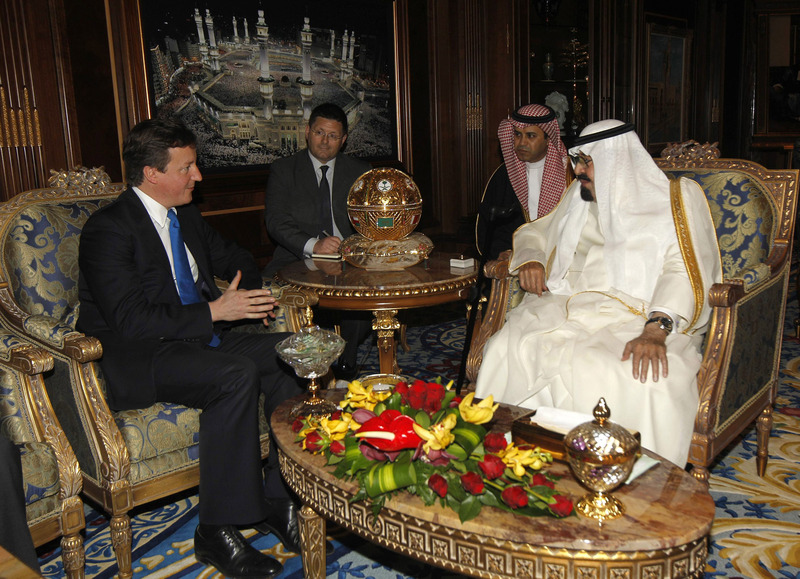 The UK’s close relationship with Saudi Arabia has been controversial for some time. In October, the government was forced to defend itself after Unearthed revealed the UK had spent £100,000 sending the Prime Minister and other officials to the Kingdom for the funeral of King Abdullah, who died in January 2015.